Welcome to the Sir Grout Singapore Blog where we discuss topics of interest pertaining to the hard surface restoration industry. Learn How Our Tile Cleaning Service in Singapore Helped This Renter Get Her Deposit Back! This Renter Etched the Marble Floor in His Home in Jurong. Could a Stone Polishing Help Him Get His Deposit Back? Who Solved the Puzzle? 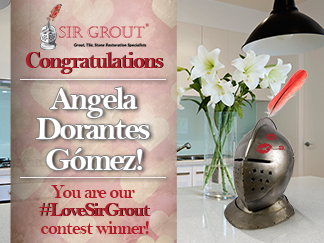 Announcing the Love Sir Grout Facebook Contest Winner, Grand Prize, and More! If you have been following Sir Grout on Facebook, you probably noticed we held our very first Valentine's Day contest, #LoveSirGrout. Many of our followers started the word hunt with us, constantly looking for the clues on countertops, tiles, and bathrooms.